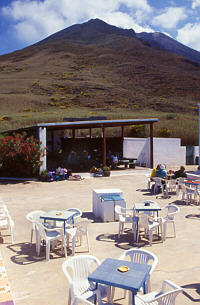 Aeolian Islands - "Volcano Hiking"
A good observation post for the nightly fire magic is the Trattoria at the old navystation Punta Labronzo (ca 30 walking minutes from Stromboli's urban district San Bartolo away). Here the narrow path to the 926 m high Stromboli mountain summit starts. For the walking to the top on late afternoon you should calculate 3-4 hours of hicking. Clowds, fog and wind witch blows the vulcanic gases to the observation points, change the mountaintop region in a few minutes into a toxic steamkitchen, where the navigation is very difficult or entirely impossible. In a starry night it may get very cold. Therefore a good equipment, a warm sleeping bag and enough to drink are necessary. For a possibly required nightly emergency descent a strong flashlight is needed. Normally, the glowing lava boulders are flying away from the spectators into the Sciara del Fuoco on the opposite side of the mountain the viewers. 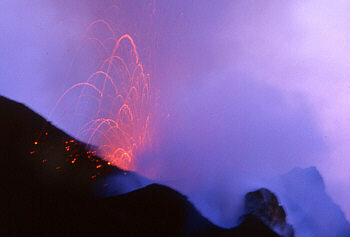 Approximately 1 to 2 times a year there is a much stronger eruption. 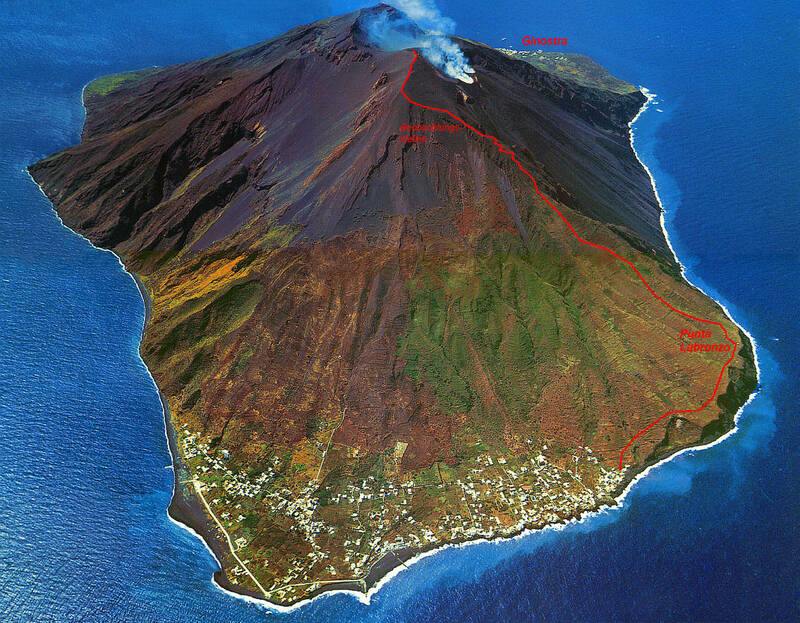 The lava then shoots with tremendous force into the sky and can also fall down towards Stromboli village. For the observer on the mountain it is getting suddenly life-threatening ! 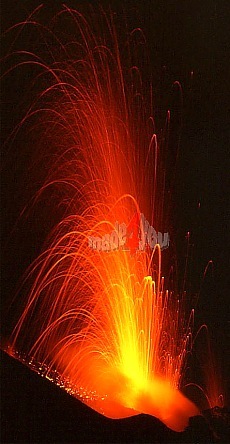 This happened at a super strong eruption on Saturday, the first June 1996 at 23:50 o'clock, when I was on the summit. The glowing lava boulders were thrown high above the sleeping climbers in the observation points, fall down as broadside in about 300-600 m height and set the Makia of the mountain on fire. The smoke was so strong that there was no chance to escape. So I had no choice but to wait with a wet towel in front of the nose and to escape the impending death by suffocation. After an hour of fearful waiting behind a rock ledge luckily some wind blows the fume away and deep down the lights of Stromboli were visible again. Now I started to descent in a hurry hurrie always with the fear in the neck that annytime could follow further strong eruptions. The photo on the right shows the Inverno a few minutes after the giant volcanic outburst from the viewpoint Punta Labronzo. 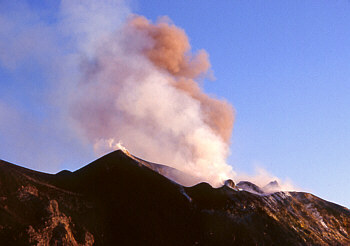 To reduce the risk, you can nowadays book a tour to Stromboli summit only with an experienced mountain guide. 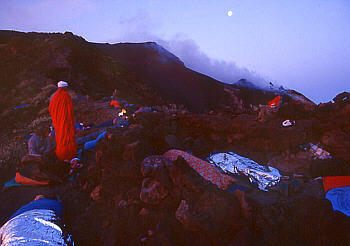 A stay overnight on the summit of Stromboli is not possible anymore, all guided groups go down before midnight again. 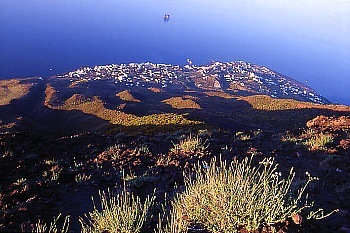 The climbing up to Stromboli summit is severely restricted after several heavy accidents and allowed only if accompanied by an official guide. Guided tours are weather dependant held almost daily, reservations will be accepted in the small tourist office on the church square of San Vicenzo. The guided groups start in the late afternoon to stay at dusk on the observation points and descent at night again. During the summer season, there are also tours starting after midnight and descend in the early morning. 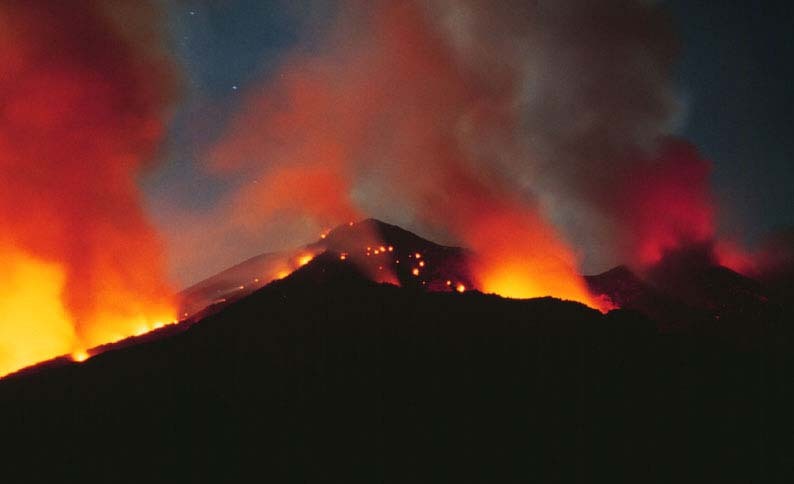 Staying overnight on the summit of Stromboli is no longer allowed.